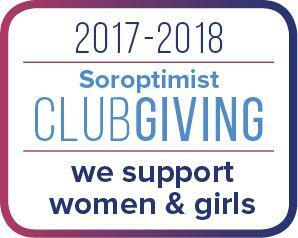 Soroptimist International of Peterborough has been recognized by SI of the Americas. SI Peterborough contributed $880.00 to support the global Live Your Dream program. We have been acknowledged as a Dreamers Contributor for the 2017-2018 Club Giving recognition period. The gift of $880.00 is going to travel the world to change the life of a woman or girl who might speak a different language, but still is in equal need of help. A woman like Sandra, from Bolivia. The $15,000 she received in Live Your Dream Awards funding and the education and stability it made possible, thanks to clubs like SI of Peterborough, ON, once felt very far away. Sandra has had a horrific life. What she dreamt of more than anything else in the world was normalcy. By contributing to Club Giving, you and your fellow members made dreams come true for women like Sandra, who is now on her way to graduating high school and becoming a chef so she can better provide a reliable income for her family.